This book presents a complete course in using Dreamweaver CC 2014 to build modern, standards-compliant, and accessible websites. It starts with a crash course that gets your students going, whether or not they already know how to use HTML and CSS. It always shows how to use Dreamweaver to build websites the right way, with external style sheets and HTML5 semantics. It presents all the Dreamweaver skills that a professional web developer should have. And it can be used alone or in combination with our HTML5 and CSS3 book for a variety of web design and development courses. Unlike the 'quick and dirty' guides that promise near-instant competency with quick routines and guidelines, Murach's really takes the time to explore its subject well, providing web designers with not just a hasty overview, but a lesson plan incorporating all the skills needed to master all of Dreamweaver's many tools and functions, whether they be beginning or advanced." Section 1 presents a crash course in Dreamweaver that has your students developing web pages at a professional level after just six chapters. These chapters don’t just show how to use Dreamweaver to build web pages. They also show how to use Dreamweaver so it generates the HTML and CSS for a page in a way that is consistent with the best practices of modern website development. That includes the use of HTML5 semantics, external style sheets, and CSS3. When your students finish the first 6 chapters, they will have the perspective and skills they need for developing professional web pages in Dreamweaver. Then, you can add to those skills by assigning any of the chapters in the next two sections...and these sections and chapters don’t have to be read in sequence. The one exception is that you should assign chapter 7 before chapter 8 since they are closely related. Like all of our books, this one has our standard features that you won’t find in competing books. Here, though, are features that are specific to this book. From the first page to the last, this book shows your students how to use the best HTML and CSS practices, even though they’re using Dreamweaver to generate the HTML and CSS. That way, they’ll be developing web pages at a professional level from the start. In contrast, most competing books focus on the Dreamweaver visual interface without worrying about the code that it generates. Chapter 2 presents the least any Dreamweaver user should know about HTML and CSS. That’s because you can’t be an effective Dreamweaver user without understanding the HTML and CSS that Dreamweaver generates. In particular, this chapter presents the proper use of HTML5 semantics and external style sheets...essential web development skills that are treated too late or too lightly in most Dreamweaver books. Because this chapter is available, you can use this book for a first course in web design or web development. Like all our books, all of the information in this book is presented in “paired pages,” with the essential syntax, guidelines, and examples on the right page and the perspective and extra explanation on the left page. This helps your students learn faster by reading less...and this is the ideal reference format for a complicated IDE like Dreamweaver. The exercises at the end of each chapter guide your students through the development of web pages using the skills that have been presented in the chapter. Because Dreamweaver has a complicated visual interface that is hard to master, these exercises are an essential part of the learning process. What makes these exercises so effective is that they never introduce skills that haven’t already been presented in the text. In contrast, most Dreamweaver books try to teach new skills by stepping the readers through them...even though that’s a frustrating, tedious, and ineffective way to learn. But our exercises never rely on “click here, click there” because that’s not the kind of practice your students need to get ready for their own projects. Instead, our exercises build your students’ perspective, their skills, and their confidence. This book can of course be used as the sole textbook for a Dreamweaver course that has no prerequisites. That’s because chapter 2 presents the HTML and CSS skills that Dreamweaver users need. If your students already know how to use HTML and CSS, they will of course be able to get up-to-speed with Dreamweaver more quickly than if they don’t. That means that you can probably assign all of the chapters in our Dreamweaver book in a single course. For a course like that, you can use chapter 2 to review the HTML5 and CSS essentials that every Dreamweaver developer should know. If you want to teach a web design course that is, in essence, an HTML and CSS course, Dreamweaver can be used as the IDE for the course. 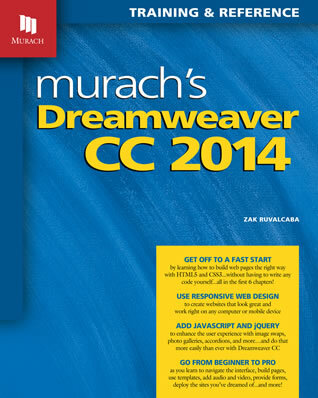 In that case, our Dreamweaver book can be used as a supplement to an HTML and CSS book like Murach’s HTML5 and CSS3. In fact, our HTML5 book and our Dreamweaver book have comparable structures that are designed to work well together. Because this book teaches Dreamweaver CC 2014, that’s the version that you should have in your computer lab. Your students should also be able to get this version for their personal computers at a student’s rate from the Adobe website. Since Internet Explorer and Safari are installed automatically, your students won’t have to install either of those browsers on their personal systems. And the appendix in this book shows how to download and install the other browsers. Remember that this book is modular. That means that you can teach the chapters in sections 2 and 3 in whatever sequence you prefer after your students complete section 1. Also remember that you don’t have to assign all of these chapters. Instead, you can select just those chapters that meet your course objectives. Often, the most effective teaching sequence is the one that best reflects the interests of your students, and this book enables you to structure your course that way. Appendix A in the book gives your students complete instructions for downloading and installing these items on their PC or Mac.